When your marriage breaks up, the last thing you feel like doing is crunching numbers. You’re hurt, perhaps angry, and possibly overwhelmed with anxiety, fear and despair. You’re focused on the past and present, not the future. But as many divorced couples learn the hard way, this is precisely the time you need to get a grip and pay close attention to your assets and your financial future, lest both slip away in the flood of emotion. First and foremost, it’s a business deal. That means you’ve got to get rid of your emotion any way you need to, whether through therapy or going to a gym. Because your divorce should be based on one thing: your property settlement. It’s a matter of numbers, that’s all it is. At least 80 percent of money is about self-management, about emotions, and 20 percent is about quantifying and computing, the counting part is easy; it’s the emotional part that’s hard. Since money is a major cause of divorce, it’s safe to assume that splitting the financial sheets won’t be easy. Pull your credit report before the divorce so that anything in dispute can be resolved before the divorce is final. The reports are the quickest and easiest way to get an overview of outstanding loan balances, mortgages and credit card debt that you and your spouse will eventually divvy up. Open individual bank, credit card and brokerage accounts. You also need to do this before the breakup is official. It will be easier to get a credit card and bank account in your own name while you are still married and share joint assets and debt on credit cards, mortgages and loans. This is especially important for women who have never established credit in their own name. A divorce can take time. To avoid acquiring additional joint debt (or suddenly losing shared bank assets) during the legal process, close your joint credit card and bank accounts. You will, however, still be jointly responsible for paying off the balance of the closed accounts. The more you remain connected to your ex-spouse financially, the more you are at risk. If possible, pay off joint credit card balances by check from your individual bank accounts or through balance transfers to your individual credit card accounts. 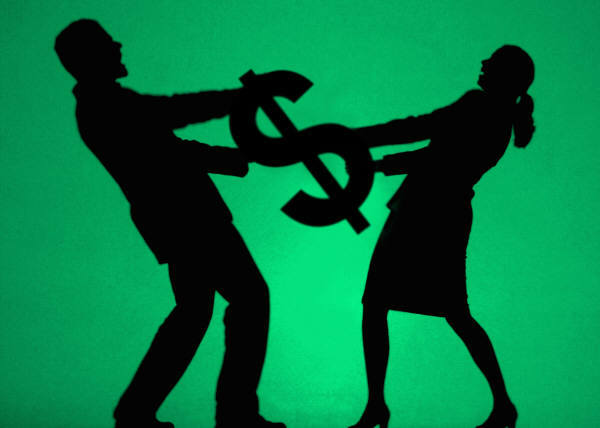 In a property-settlement agreement, couples often split their debt. What will happen is, one person declares bankruptcy down the road and the credit card companies come after the other. You might be better off each borrowing in your own name and each paying off the credit cards so that you come out of the marriage without any joint debt. Keep separate property separate. Assets you brought to the marriage separately (real estate, vehicles, an inheritance, gifts, money you acquired before marriage, etc.) are yours to take away from the marriage. But if you put any separate assets into a joint account, they may be considered joint property and will be divided depending on the property laws where you reside. Traditionally, women tend to hold onto the family home at all cost. Unfortunately, it’s often an emotional decision that makes poor financial sense. Studies say that women will keep the house and give up the retirement money. I recommend that they look seriously at selling that house, even though it’s hard. It’s an emotional tie that ends up strangling the woman. She ends up losing it anyway, and she has given up her retirement money. I ask women to just think a little bigger. Change those beneficiaries.Despite what your divorce decrees, if you don’t change the beneficiaries your ex could have an unexpected windfall in the event of your untimely demise. As long as you’re at it, this is a good time to review your various policies to make sure they fit with your new circumstances. And don’t forget to delete your ex-spouse from these documents and policies and change your marital status where applicable. Reclaim your name. For some women, divorce adds another task: reclaiming your name. If you are reverting to your maiden name, you may be required to produce the divorce decree or document signed by your ex-husband that acknowledges your new name in order to obtain a new driver’s license, passport or other identification. Don’t forget to register your name change and other tax forms and with the Social Security Administration. Check your retirement. Most importantly, remember that living well is possible whatever your net worth or marital status. I am really really glad you liked this post mate. I remember you had encouraged me to make a post like this one. Its great that you have only 4 more years to be debt free and not 18, anyway you appear to be happy the way things are with you and thats good. I have lived under heavy debt in the past and I don’t even want to remember how stressful it was. AWW man, living debt free today is out of the world feeling, thanks to GOD. Take care Anna and cheers. I have a buddy who went through an ugly divorce. Bad scene. so that’s my “ounce of prevention” tip. And it’s good for men and women. Divorce scenes are invariably ugly mate. I have also been in some serious relationships, its a pity we went separate ways but we are still friends. You should have given me that ounce of prevention tip 5 years back mate 😉 . The scene is not bad or ugly as of today, but neither party is pressing for divorce, just letting mother nature take its own course, let it die its own slow death. I need to do another post on this later, got a couple of more ideas to share here. I really liked this post – it’s a fair warning to people who find themselves in the sad situation of a divorce. Never the easiest time to plan things, it’s useful to have a check-list like this at hand. I look forward to reading more of your posts, Rob. Along with making necessary changes to joint assets, remember that you may need to adjust legal documents such as your will and life insurance policies. Ensure that these now reflect your current wishes on how your property should be disposed of when you pass on. Think carefully if you also want to change the trustee designation for your children on your life insurance and bank accounts. .-= Harry@divorce and kids´s last blog ..Cause and Effect of Divorce with Kids =-. So, treat your financial life with care after your divorce. You’ll end up better off than before, both financially and psychologically. It’s all part of treating yourself, and your children, if you have them, with respect. It’s time to take-on your financial life! .-= michael@saving a marriage´s last blog ..Stop Your Divorce Before It Causes Heart Ache =-. Just basically wanted to mention I really value your work on this weblog site and the high-quality articles you generate. These type of posting tend to be exactly what makes me going through the evening time. We found this article after a great close pal of my very own recommended it to me. I perform some blogging and site-building professionally and I am often grateful to check out others contributing top quality information towards online community. I am going to definitely be following and additionally have book marked your internet site to my bebo accounts for other people to see.